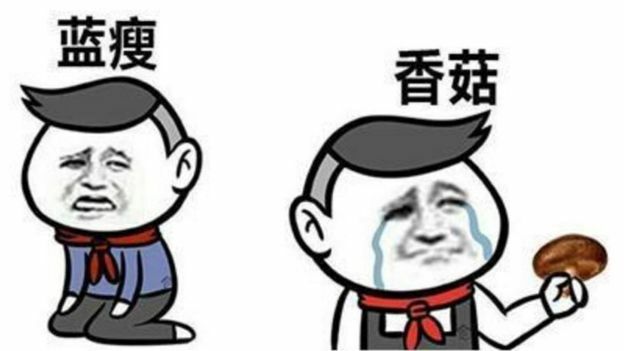 Memes go viral quickly on Chinese social media, and become an important part of popular culture for the short time while that they remain novel. Most Chinese internet buzzwords poke fun at events in the news or mock something affecting their daily lives. While some of these internet phrases come off as derisive or purely cynical out of context, they are usually meant in a good-humored way, like sarcastic jokes between friends. 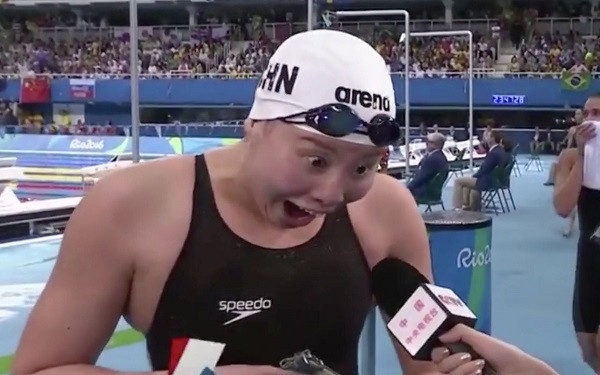 Having been informed by in a live interview that she had just qualified for the final round of the 100-meter backstroke at the Rio Olympics, Fu Yuanhui’s exaggerated facial expressions and declaration that she had used “prehistoric powers” (洪荒之力 hónghuāng zhī lì) made her an instant internet trend. While "prehistoric powers" could refer to a number of different things in Chinese mythology or popular culture, it was the rawness and sincerity of her reaction that endeared Chinese internet users. “Was I really that fast?” Fu exclaimed as the reporter told her she had made it in under 59 seconds. The reporter asked her if she had given everything at the event, and Fu reacted by explaining that she must have tapped into some sort of primeval natural energies when she was swimming. Fu went on the win the bronze at the event, and the episode, which was easily the most memorable moment of the Rio Olympics for internet users, saw her WeiBo follower count go up from 56,000 to 3,710,000 in two days. Dating is a frequently discussed topic in Chinese social media discussions as it is a social issue many young people care about. Unfortunately for one young man of Guangxi province in South China who uploaded a video complaining about the woes of his love life, Chinese netizens decided it was time to poke fun at the subject, and at the same time make fun of his regional accent. Attempting to say “I feel so hurt, I want to cry” (难受，想哭 nánshòu, xiǎng kū) in the standard putonghua dialect, the man's heavy accent made it sound like, “skinny blue mushroom” (蓝瘦香菇 lán shòu xiānggū). 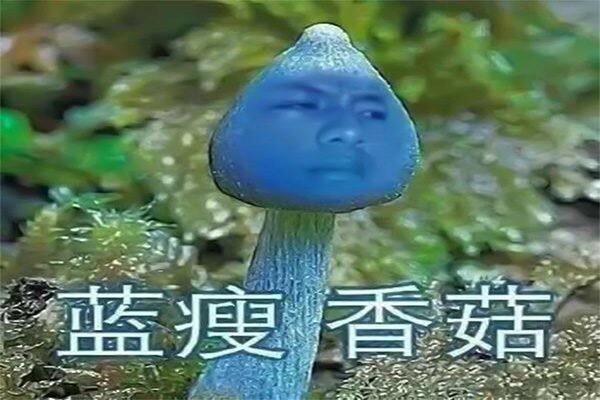 While some internet users later criticized the viral videos and memes for lacking tolerance for regional dialects, most concluded that “skinny blue mushroom” was a good-natured joke in the end. The man, a scooter salesman named Wei Yong, has since become an internet celebrity on China’s live-streaming sites. 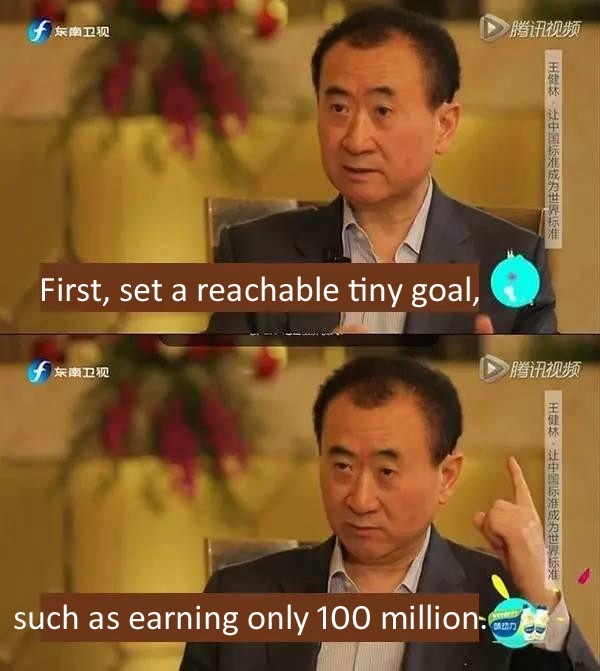 China’s richest man Wang Jianlin struck a false note with China’s netizens when he suggested in an interview that, “it is the right direction if you want to be the richest man in the world, but you had better set small targets, for example, earning 100 million first.” While $14.3 million is not a big deal for Wang Jianlin, Chinese netizens expressed sarcasm at the idea that earning that much would be a “small target” (小目标 xiǎo mùbiāo). 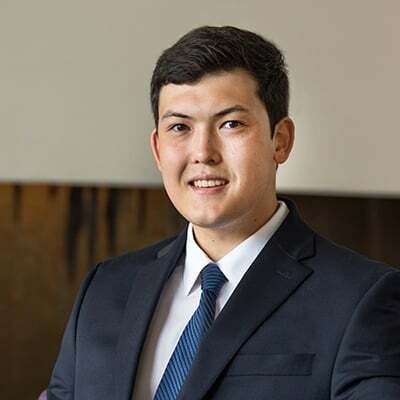 Using the “small target” hashtag, some users said they would first set a "small" weight loss goal of 30kg (80lbs), while others suggested they wanted to be married the next month. This meme started as a cartoon of two penguins sitting on either side of a “friend-ship” (友谊的小船 yǒuyì de xiǎochuán). If one of the penguins loses weight, the cartoon says, the boat will capsize and they will both fall into the water. The cartoon is a metaphor for how cyber friendships can hang in a delicate balance, and as it is easy to block or delete one’s social media contacts. 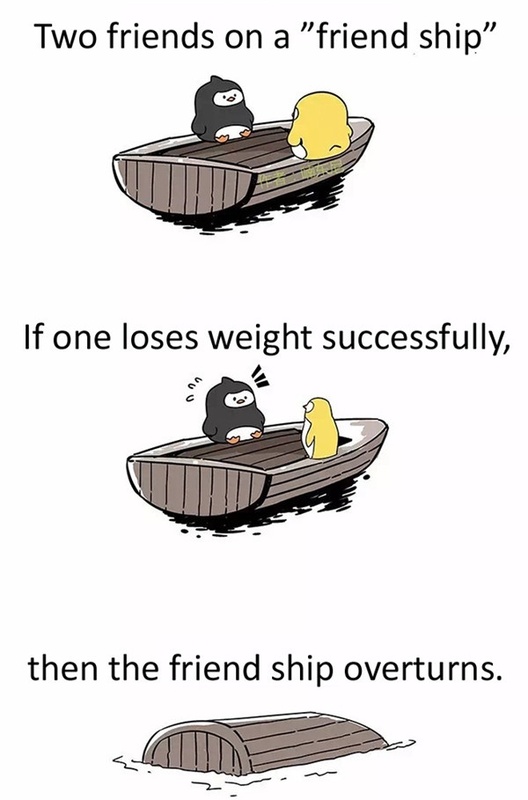 The cartoon's suggestion that something as minor as losing weight might make a friend jealous, led to the buzzphrase “the friend-ship boat capsizes too easily” (友谊的小船，说翻就翻 yǒuyì de xiǎochuán, shuō fān jiù fān). The cartoon turned into a viral meme which was shared 78,000 times in 10 days, with users providing their own explanations for why the "friend-ship" had a falling out. 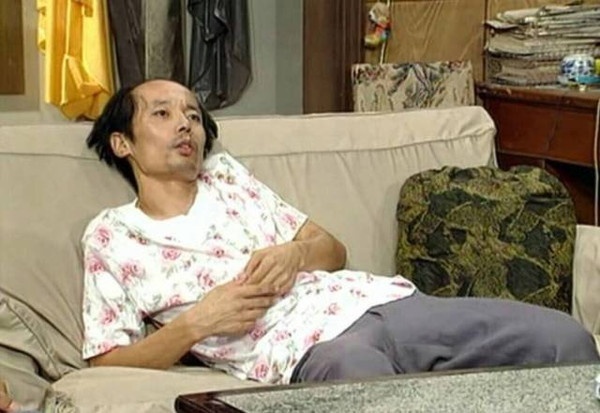 A stage photo of Chinese actor Ge You (葛优 Gé Yōu) from a TV series, “I Love My Family,” that aired 20 years ago became popular in July as a comical way to express weariness over social media. Ge You’s character was a skinny and forlorn figure in the comedy known for being lethargic, depressed, and very lazy. The actor's name is a homonym for “bro” (哥 gē) “again” (又 yòu), so when combined with “lie down” (躺 tǎng), the buzzphrase 葛优躺 might be interpreted as, “bro slouches again.” This meme is a comment on the competitive work environment and the high cost of living in cities, and expresses the desire to take a break. “The melon-eating masses who don’t know what’s really going on” (不明真相的吃瓜群众) often refers to bystanders who witness an event but do nothing about it. Although the origins of this meme are fuzzy, one theory is that the unfinished part of the melon near the rind is a metaphor for how some people avoid getting to the bottom of an issue. 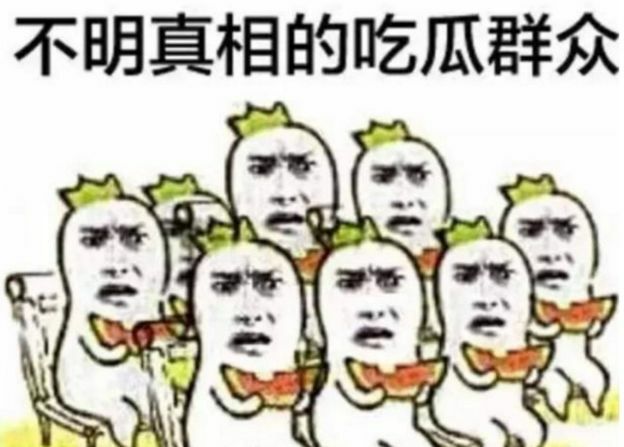 Another theory is that it started when netizens took notice of one elderly witness of a traumatic event who being interviewed said, “I was just sitting here eating watermelon when it passed me by.” Whatever the origin, "melon-eating masses" (吃瓜群众 chī guā qúnzhòng) can refer to onlookers at an incident who did nothing but stand and watch, or to netizens' detachment from issues that don’t directly affect their lives.